Years ago I used to buy books at a famous bookstore in downtown New York City, in the old book selling district. This bookstore was famous for the range of subjects it carried, its steady inflow of new books, and the lively and sometimes erudite people you could meet browsing the narrow aisles looking for an out of print book or a bargain read. The other reason this bookstore was famous was the shelves of books near the front of the store that proudly displayed Reviewer Copies for sale. These books, dutifully rubber stamped with large “Reviewer Copy: NOT FOR RESALE” stamps, were in new condition and often still had publicity information from their publishers stuck inside the covers. Sometimes you could see people arrive with cartons of these books, which they would sell to the store. Particularly prized were the bound galleys or as we call them now, advance review copies, (ARC) intended for pre-publication reviewers and advance reviewers with long pre-publication schedules, and usually sent out 4 months before the official publication date. At one time these uncorrected proofs were bound up in plain covers and sent to the early reviewers. Now, digital proofs usually take their place. However, you have to be careful when preparing the cover artwork for your ARC because a misstep here could completely eliminate any chance of getting a valuable review in one of these trade-oriented review sources, such as Publishers Weekly or Library Journal. These are reviews that can potentially sell thousands of copies of your book. Make sure you know what they are looking for. “Unfortunately, they are all the most important reviews a publisher can get,” according to SPAN (Small Publishers Association of North America). Unfortunately you cannot use this cover for the cover of your ARCs because it obviously is the cover that will be on the finished, printed and bound books. With pre-publication reviewers it’s important to maintain at least the fiction that this is an early proof, whether or not it is. And make sure your book is not for sale on Amazon.com, because that alone could disqualify you for inclusion in these review media. Also the bar code on the back cover is intended only for resale, so the existence of the bar code alone would alert a reviewer at one of these publications that this was not, in fact, an early, not for resale, proof copy. Straight to the recycling bin for you! And most importantly, the Marketing Campaign box has completely obscured the bar code. This cover definitely cannot be used for retail sale, and that will help maintain your eligibility for pre-publication reviews. Now it’s up to your book and all the care and attention you’ve put into it, to shine. Was said NYC Bookstore the same name as one of Stephen King’s novels? Do you think it’s necessary to do an ARC cover version for a book that’s going to be released exclusively as an e-book? My cover already has no bar code. I think it would still work, Sandra. ARCs are usually produced near the end of the publishing process before the book is completely finalized. If you circulate an ebook in a similar way, I would create a separate ARC cover. After all, it’s just a modified version of the cover file. I’m planning to send out ARCs for a few books (most likely printed via Publishers’ Graphics). And I’m curious as to actual timing of receiving reviews–if one is fortunate enough to get them. Many pre-pub reviewers ask for the ARC 3-4 months in advance of publication, and I plan to send them 4 months in advance. In your experience, when are the reviews completed, if at all. Before publication? A month before publication? Sometime around publication? I’m trying to decide whether to wait for the reviews until the last possible moment–for the chance of printing a review blurb on the final copy. Or is it just not likely that I’d get any reviews with enough time to print them on the book cover? My book is being published with Create Space. The book will be reviewed by two sources. Is it necessary to have an advanced review? It should be completed around Dec. This is all about soliciting reviews before your official publication date. 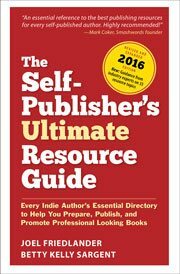 But many self-publishers aren’t bothering with an official date. If you are soliciting reviews after your publication date (first day your book is for sale to the public) then just use regular production copies. Hi Joel, great article by the way. I have a question – if one is looking to self-publish, and submit the novel for reviews within the blogging / indie community, would you need to design an ARC for this purpose? Or is this more for the formal publishing industry? If I were to query bloggers (as suggested in ‘How to get Reviews for your self-published book’), would a simple one page query letter be sufficient? Ken, I don’t see any need to create a separate ARC for book bloggers, one size should fit all reviewers. And yes, the procedure I outlined in the article you mentioned relies on a short query letter, because it’s whole function is to evoke a request for the book. Hey, we’re all busy, so the shorter the better, as long as you give enough information for the reviewer to decide whether it’s a good fit for them. I ditto the questions above, regarding timing of ARCs and how to get the most out of reviews (not to mention how to get the most reviews). Your website is so wonderful and so thorough, I’ll bet you’ve already dealt with this. Just point me the way, please, if there’s an archived article. Many thanks. Different types of reviews have very different timelines you need to know about if you want to run a review campaign. It seems like I haven’t written about this in some time, although I published an article on Jane Friedman’s blog last year you might find helpful: How to Get Reviews for Your Self-Published Book. Watch for a blog post on this topic in the near future. Your article on Jan Friedman’s blog was very helpful, Joel. I look forward to your next blog post on the subject. Many thanks. Oh dear, just when I think I’m getting the hang of things, I realize I’m completely ignorant about something else. Can you help me understand pre-publication reviews? When are they generally done (timeline) in relation to the book’s actual release? I’m assuming the goal is … to get buzz around the actual publication date? If I don’t do pre-publication reviews, what are the drawbacks? That is, will some reviewers only review the book if it hasn’t yet been published? Another area for me to read up on here! Thanks much! Suzanne, I feel the same about you. Looking forward to a successful publication! Lightning Source will not print a book without a barcode on the back, even for use as an ARC. It can be smaller than the normal ISBN barcode used for retail sales, and does not need the numbers above the bar, or the price, but it has to be there. If the publisher does not include it, Lightning will insert it where they can find the space. Self-pubbers who use Lightning should plan for this so there are no unhappy surprises. I’ll be sending out ARCs in about a week for a book coming out next March. My previous self-pubbed books were released without ARCs. And a theory (not a fact): the marketing and promo information may be important if the ARC is intended to get bookstore business, but probably won’t be important to reviewers. Michael, thanks for the input. If you are going to print POD it pays to have another supplier for ARCs. I’ve used Alexander’s who does a great job. When the book is ready, you just upload to LSI. Check them out. My experience with reviewers is that they actually do pay attention to the “marketing plan” info on the ARCs even if, like resumes, we know there’s about 50% inflation.